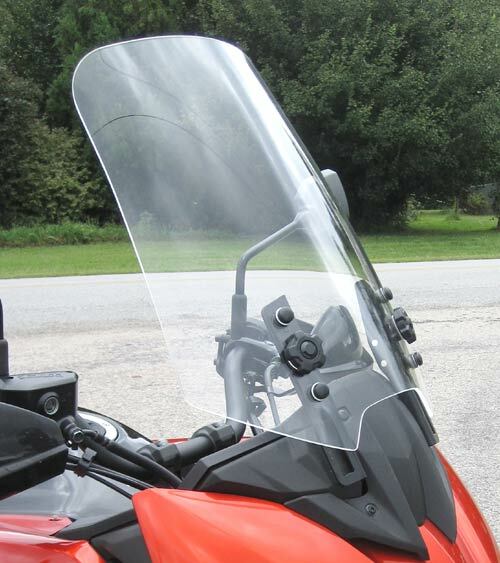 Parabellum’s Touring windshield for the 2015- Versys 1000 is the perfect answer for those looking for more protection and less wind noise while still looking good. The Versys 1000 is an excellent motorcycle lacking only in the windshield department. Our screen mounts to the factory adjustable mounting system (with provided fasteners) so riders will be able to find the perfect windshield adjustment for any kind of riding or protection desired. The Parabellum Versys 1000 Touring shield is 17 inch wide at the bottom tapering to 14 inches wide at the top. (stock shield is 16 inches wide tapering to 9 inches) It’s made of 3/16 military aircraft grade cast acrylic and comes in three heights and clear or tint. The Parabellum screen looks great, functions well and is built to last.